Early summer is just the perfect season for strawberries, the berries with beautiful look and amazing taste. Known as common ingredients of jams, bakeries, desserts, jellies, syrups, ice-creams and so on, strawberries have a variety of therapeutic properties, and even using frozen berries can help you enjoy strawberries health benefits year round. Below, there are some facts about strawberries and their therapeutic powers. 1. Strawberries are considered to be among the best sources of vitamin C: 100 g of the berries have 120 mg of this vitamin. 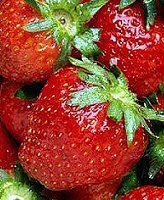 Also, strawberries are rich in such nutrients and microelements as potassium, iodine, manganese, magnesium, copper, vitamins B group, as well as omega 3 fatty acids, antioxidants and dietary fiber. 2. Nutritionists recommend adding strawberries to daily diet of the people, who have anemia as these berries can strengthen capillaries and enrich our blood. 3. Strawberries have excellent diuretic and diaphoretic properties, they can assist in treating such ailments as hypertension, atherosclerosis and so on. 4. Strawberries health benefits include also positive effects on our appetite and digestion, stimulating the function of kidneys and respiratory system. Besides, strawberries are among the best known thirst quenchers. 5. Consuming strawberries on a regular basis can help improve mental abilities, protect against macular degeneration and assist in effective weight loss management. 6. Increased content of vitamin C adds to strawberries health benefits such important properties as prevention of rheumatoid arthritis and osteoarthritis. Filled with antioxidants and detoxifiers, strawberries stimulate toxin removal, prevent muscle degeneration, reduce swelling and joint pains. 7. Besides, abundance of antioxidants in strawberries allows those who regularly consume this delicious herbal remedy to enjoy all the benefits, starting from cancer prevention and ending up with rejuvenating the body and improving brain function. 8. Strawberries are rich in an organic acid which assists in neutralizing harmful toxins produced after smoking tobacco. Therefore, keen smokers can protect themselves by eating strawberries regularly. « A Healthy Lifestyle: Where To Begin?